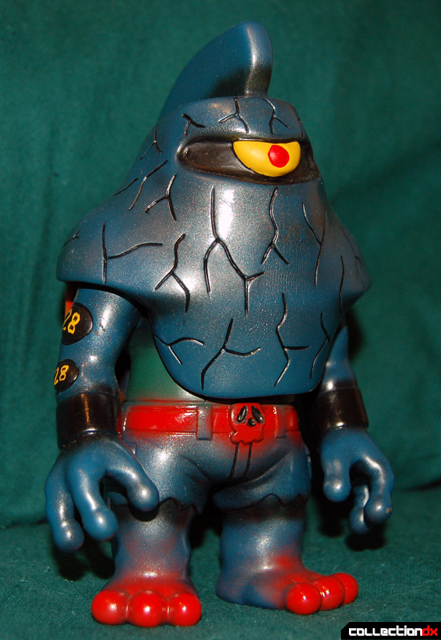 Mutant Bigaro is the third Real x Head to use the Mutant head body as a base, as well as the third friendly character in the Mutant Zone Series. 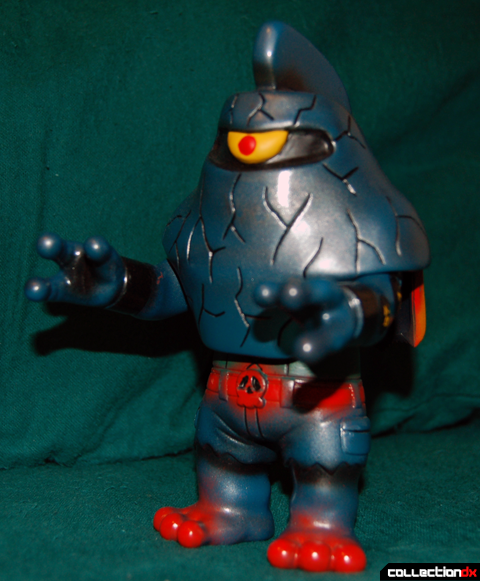 The Encyclopedia of Kaiju interview describes Mutant Bigaro as a childhood friend of Head's and a gentle character. Bigaro looks to be a bit of a brute when compared to the previous Mutants, with a stockier look and single eye in a large cavity, similar to a Zaku mono-eye from the Gundam series. Bigaro has visible cracks in his skin, suggesting a thick and rugged hide, to me, as well as a cape on his back. The actual physical design of the figure in making a new character is unlike any other figure in the line (except for one specific case that we’ll get to later), but the idea of creating add-on parts for the Mutant body to create different characters over a single base body is something integral to the Real x Head style and business plan. Instead of using the neck joints already on the Mutant body, the Bigaro head-piece is a cowl that fits over the shoulders and neck of the Mutant body, using a piece of foam in the front and back to keep it safely in place. This is both a blessing and a curse, and I have somewhat mixed feelings about the Bigaro head-piece. Because the head-piece does not actually clip onto any specific mounting point, it has a large range of movement on its shoulder perch, and can be very expressive. At the same time, however, I do not like how the head-piece flops around in your hands while you handle the figure, making the figure feel almost incomplete. As such, I typically relegate my few Bigaros to shelf-duty and leave them alone. Even with this problem, Bigaro is a popular character with many different colorways, and I am a big fan of the design even if I do not care for its actual execution. The particular figure pictured here is a custom of mine. 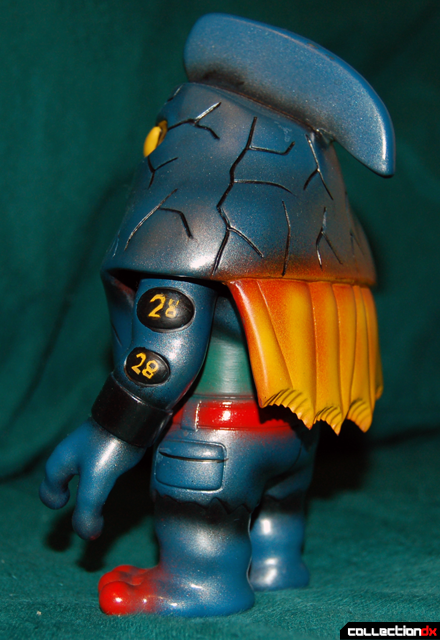 The stocky and round appearance of Bigaro gave me a classic Gigantor (Tetsujin-28) feel. I painted the cape to look like flames from Tetsujin’s jetpack, and took advantage of a piece of advice Sanjeev gave me on how to give the blue a metallic finish without using a metallic blue paint by over-spraying the blue coat with a thinned down coat of silver. I painted over a beige ‘flesh’ blank, just like the Mutant Evil I reviewed, as can be seen through a number of spots on this figure where the paint has rubbed off… I did not do a good enough job of sealing this figure, and the paint is not well enough protected, especially around where the head-piece rests on the shoulders. I love the design of this guy, and the Tetsujin style paint scheme and torso just make it all the more appealing. Looking at the top and bottom, they almost look like they're a part of two different toys entirely. Thanks! I'm glad you picked up on that... I think the way Mori has added on things to his original basic design to create new characters is really fascinating... you'll get to see loads more variations tomorrow with my big Chaos retrospective, as well as some of the other characters I have in the pipe. I do have to ask though, how is the head articulation on it? I would think it would be pretty limited based on that huge drape. Well, it's articulated at the shoulders, but as I said above, the head-piece is not really attached, and floats on top of the shoulders using two pieces of foam for tension, so you can raise and lower and tilt it and get all sorts of expression while still being able to move the arms... obviously you can't move them all the way around, but it works. Hm... Curious. I think I understand what you mean, but I feel like I need to actually see it for myself to get a grasp on how it looks and what not. Fair enough... it's probably something I should have included in the review... I can add a pic of how it works the next time I am home to take a photo. I didn't bring any Bigaros to school with me.